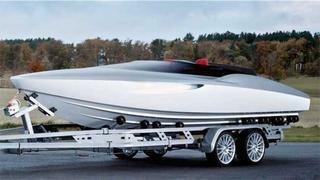 Jaguar and Canadian yacht designer Ivan Erdevicki have designed a 6.1m speedboat. The concept was the result of a collaboration between Erdevicki and Ian Callum, Jaguar’s director of design, and is a modern take on the traditional powerboat form. The design has a composite hull, moulded air-intakes and the deck is finished in a natural teak. The bow section flows into the windshield and the red 2+1 cockpit with the aft section is split by a carbon-fibre fin, inspired by the Jaguar D-Type. The whole concept was inspired by the sporting character of Jaguar cars and was specifically designed to compliment the new Jaguar XF Sportbrake car. A life-size model of the boat has been built.